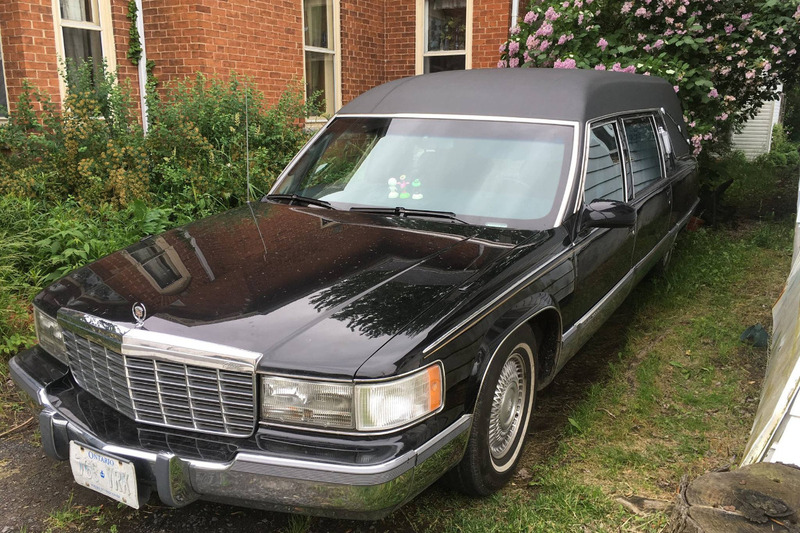 Lucille is a 1996 Cadillac Fleetwood hearse. She was purchased by her current owner on Victoria Day, 2017. Her owner, known as The Witch of South Mountain, has had a lifelong obsession with the weird, bizarre, and otherworldly. The day she bought Lucille, she drove her across Southern/Eastern Ontario and her name was established well before the 2/3 mark. Clearly, Lucille was the last "passenger" in the car. Since then, Lucille has been dearly loved by her owner. She has a resident skeleton in the passenger seat (his name is Rufus), and has become a neighbourhood favourite. Children from miles around come to have their pictures taken with her. Unfortunately, in the winter of 2017, Lucille had a clogged artery and she needs heart surgery. The third and fourth gears have seized, and she needs a double bypass (new transmission). Poor Lucille had a gentle upbringing and never had to exert herself past 60 km/h. Her new owner loves to drive her hither, thither, and yon. She desperately needs a new heart to keep the community together.